It isn’t easy, but Martha and her parents escape slavery with the help of many kind conductors for the Underground Railroad—an escape route set up by people of all colors. After many weeks, they find an entrance to a station hidden securely in a hill. A station is where caring people help the slaves hide from those who would keep them captive. They finally have a safe place to stay. Mamma has caught pneumonia because of the rainy weather and the many cold rivers and streams they crossed. 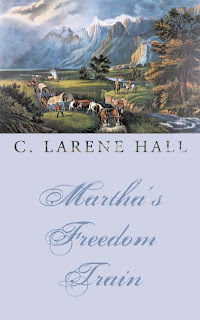 Papa learns about a wagon train of Mormons traveling west, and he takes Martha to meet them. Her heart almost breaks when he promises to come find her when her mamma is well, but insists she must go west with these strangers. Those in charge decide that Martha will travel with an older woman. It isn’t long before Martha calls her Grandma. Since Martha has walked for weeks escaping slavery, it isn’t hard for her to adapt to the situation of traveling with these people. Martha meets a girl, Laura, who is near her age and they become good friends. Martha encounters many exciting adventures along the way. They cross rivers, see Indians and buffalo. She helps put out a fire, and after falling asleep beside the trail, they accidentally leave her behind. Once they reach the Salt Lake valley, she still has choices to make. She wants to stay in Salt Lake with her new grandma, but Laura’s family wants her to travel south to help them build a new home. She longs to go with her new friend, but if she leaves, she wonders how her papa will find her. I read Martha's Freedom Train with my 8 1/2 year old daughter. She really enjoyed it. While we read, she asked me lots of questions about why there had been slaves, what was it like for them, how did they become free, etc. Very good discussion points and a good mom/daughter moment. It was also my daughter's first exposure to reading a story about the LDS pioneers heading west. Since we don't have any family pioneer stories, it was fun to talk about what it must have been like. She's been reading Little House on the Prairie with her Dad, and we talked about the similarities between Laura's family moving & the pioneers looking for a new home. This was a very enjoyable read. I highly recommend it for children, especially for Black History Month (February) or Pioneer month (July). To purchase your copy of Martha's Freedom Train, click here. This was a great story for children and I enjoyed it as well. Thanks for sharing your thoughts.